I now have a new track system for 1/32nd and 1/43rd size cars too. It comes in 2, 3 and 4 lane configurations. 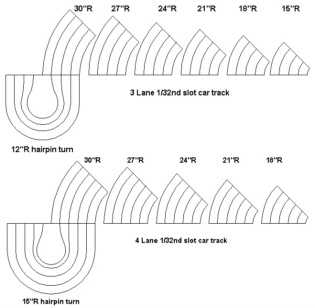 Lane spacing is normally set at 3.125". 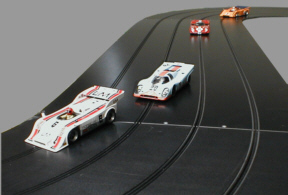 Which is wider than Scalextric, but not as wide as Ninco or Carrera. But if you would like some other lane spacing, then I should be able to accommodate that. There is a extra roadway on the outside of the corners for some "fishtailing" room. Tracks can come with many different types of electrical conductors. 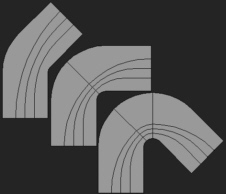 Rail, wire, braid or tape. Whichever you think is the best. 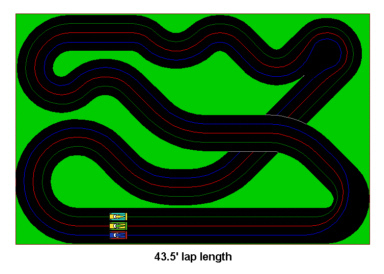 - I can build custom adapter tracks that adapt one brand of track to other brands of track. Including mine. 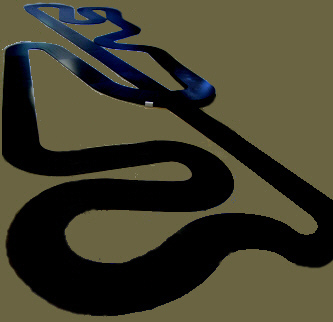 - I currently have some custom hairpin turns to fit inside Carrera's #1 turns for sale.